Stephen Charles Wood (54): Bond Street, Leigh - Drove a large goods vehicle that was unlicensed: Fined £193, ordered to pay vehicle excise back duty of £328, pay costs of £85. Adam George King (31): Chaucer Grove, Atherton - At Tyldesley, assaulted Anthony Kendrick by beating: Jailed for four weeks, offence so serious as an assault on a security guard who was attempting to detain him for stealing from a shop premises, pay a surcharge to fund victim services of £115. David Smith (51): Bridge Street, Hindley - At Hindley, assaulted Lilianna Brooks by beating on three separate occasions, without lawful excuse damaged a living room wall to the value of £100 belonging to Lilianna Brooks, harassment of Lilianna Brooks: Jailed for 16 weeks, suspended for 18 months, restraining order not to contact Lilianna Brooks directly or indirectly, pay £275 compensation, pay a surcharge to fund victim services of £115, pay costs of £150 to the Crown Prosecution Service. Simon Murphy (33): Derwent Road, Hindley - Drove a DAF truck on the A6062 Livesey Branch Road, Blackburn, at a speed exceeding 30 miles per hour, drove a car on the M6 motorway at a speed exceeding 50mph, in contravention of a temporary maximum speed restriction: Fined £92, pay a surcharge to fund victim services of £30, pay costs of £90, driving licence endorsed with six penalty points. Michelle Fowden (42): Cameron Street, Leigh - Failed without reasonable excuse to comply with the requirements of a community order given for failing to ensure her child attended regularly at Lowton High School: New community order made with requirement to carry out 100 hours of unpaid work within the next 12 months. Michael Ashley Worgan (26): Kirkhall Lane, Leigh - Assaulted Billie-Jo Moonan by beating her: Community order made with rehabilitation activity requirement and 80 hours of unpaid work requirement, pay a surcharge of £85 to fund victim services, pay costs of £85 to the Crown Prosecution Service. Geoffrey Wayne Ashcroft (38): Briar Grove, Leigh - Entered Toyfields Soft Play Adventure Centre as a trespasser and stole an MP3 player and chocolate to the value of £60, broke bail condition to abide by a curfew - pleaded guilty: Committed to Bolton Crown Court for sentence on September 4. Christopher John William England (30): Oxford Street, Leigh - Caused Kathryn Smallwood and Keith Wilde to fear that violence would be used against them, damaged a kitchen window to the value of £180 belonging to Kathryn Smallwood: Committed to prison for 17 weeks suspended for two years with rehabilitation activity requirement, restraining order not to contact Kathryn Smallwood or Keith Wilde and not to go to Highfield Avenue, Golborne, or Heath Street, Golborne, pay a surcharge of £115 to fund victim services, pay costs of £100 to the Crown Prosecution Service, pay compensation of £180. Nathan John Dawber (24): Patterdale Road, Landgate, Bryn - Drug driving with cocaine in the blood, driving when there was not in force a policy of insurance: Fined £540, pay a surcharge of £30 to fund victim services, pay costs of £85, disqualified from driving for 14 months. 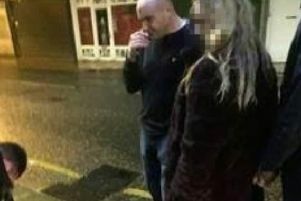 Lee James Atherton (25): Harbury Close, Wigan - Drink driving on Bridgeman Terrace with 78 microgrammes of alcohol in 100 millilitres of breath with the legal limit being 35 microgrammes: Fined £260, pay a surcharge of £30 to fund victim services, pay costs of £85, disqualified from driving for 20 months. Patrick Anthony Caldwell (35): Scholes, Wigan - Attempted to enter as a trespasser at the EE mobile phone store in Wigan: Jailed for 12 weeks, suspended for one year,pay a surcharge to fund victim services of £115.